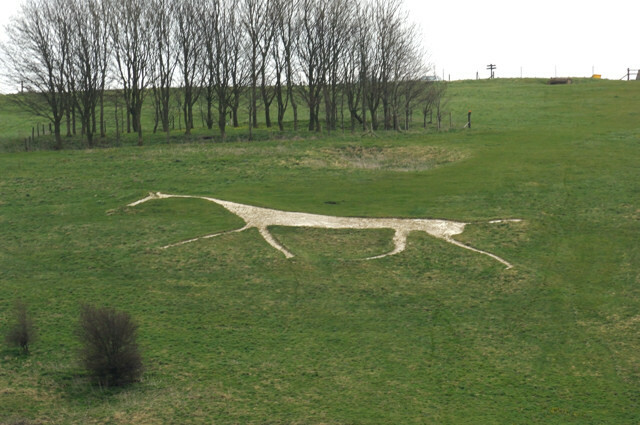 The white horse faces WNW, is near The Ridgeway on the edge of the Marlborough Downs, two miles south east of Broad Hinton village, on Hackpen Hill where the Wootton Bassett to Marlborough road zigzags up the hill. It is said to have been cut by Broad Hinton parish clerk Henry Eatwell, in 1838, with the assistance of the landlord of a local pub, to commemorate the coronation of Queen Victoria. It is visible from the main 'A' road to Avebury, from Swindon/Wroughton, and from high ground near the village of Cliffe Pypard to the west. As its not very large, it is best photographed from the road that approaches it, and there are a variety of points along this road where you can see it clearly. As its on quite a shallow slope, although jacked up a little on an embankment, it gets shortened as you approach it. Its currently in good condition, but at times in the past it has become overgrown, and more difficult to see. The car park on The Ridgeway, is about 1.5 miles from Barbury Castle (hill fort), and as it is approached, the Ridgeway goes down and up again allowing you to get excellent views of the castle, and countryside. You can also park far nearer to the castle on the other side, only a field or two away. About 2.5 miles in the opposite direction from The Ridgeway parking (towards Avebury) is an area on The Ridgeway that passes through a lot of stones/boulders known as grew weathers (as in the mist they are said to look like sheep), this is the rocks that were transported to make both Avebury and the larger jointed stones at Stonehenge. Any time, but best photos on clear day when light is onto the horse. From Wroughton follow the A4361 to Avebury, just past the pub on your left at Broad Hinton take the left turn onto the road towards Marlborough. It's right in front of you on the hill. From the parking place on The Ridgeway cross the road, its in the first field on the right, path to White Horse. White Horse, The Ridgeway, views. Special Needs Access: Difficult, but easily seen from road. Children Facilities: Real horses often in field where white horse is, as people have fed them they have become over interested in visitors, perhaps not ideal to take small children. Dogs Allowed: Real horses often in field where white horse is, as people have fed them they have become over interested in visitors, so perhaps don't take dogs into this field.